DTM enables route planners to use high resolution XYZ bathymetry survey data that is directly imported and processed in MakaiPlan, streamlining the process. 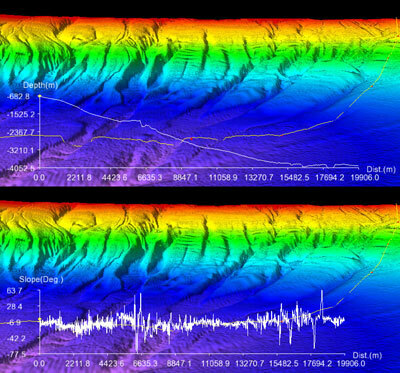 With DTM, it is no longer necessary to purchase and learn different software packages from different vendors to process digital terrain data. The entire planning process can be performed within MakaiPlan, increasing the accuracy and efficiency of the design process. Create contour colored maps (colors, numbers, and spacing of contour lines are user defined and maps can be directly loaded into the GIS database), which allow the user to visualize either water depths or the maximum seabed slopes. Create color shaded relief maps with user definable sun elevation and azimuth. Superimpose the RPL on any of the created maps and quickly generate accurate slope graphs along and across any desired route section. 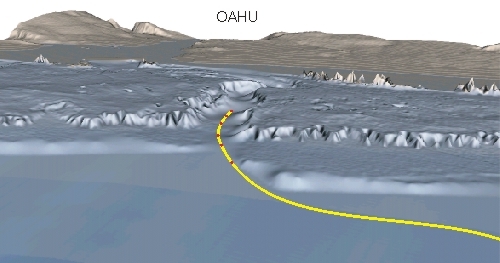 These along and across path profiles are generated by cutting an accurate slice through the entire grid, and therefore, can be used to compute more accurate values of seabed distances and slacks than those computed using the conventional method of intersecting bathymetric contours. All maps can be automatically geo-referenced as Geotiffs and be viewable as layers on the main MakaiPlan GIS window. Optionally, the capability to load and visualize sections of the survey data in 3D. 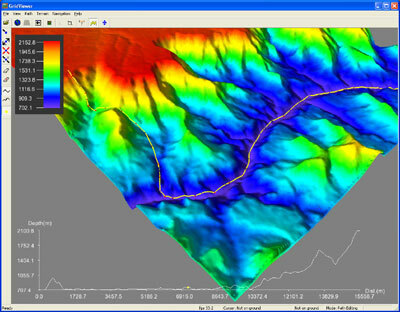 With these techniques, accurate slopes along and across track can be easily computed and incorporated in the calculation of seabed slack. Colored shaded relief images in conjunction with detailed color contour maps can be automatically geo-referenced and incorporated in the overall GIS database to further facilitate the selection of the optimum cable route. 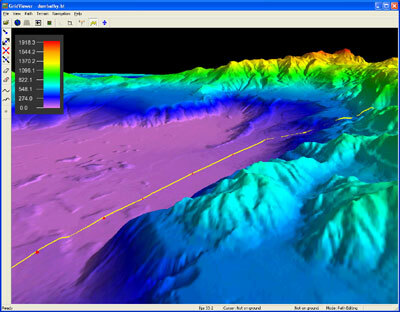 Using the 3D Viewer bathymetry can be viewed from any perspective to assist in choosing the best cable path. Grid maneuvering include zoom, rotate, pan and include a variety of lighting effects. In addition, an optional profile view of the seafloor can displayed depicting the range in depth and distance. The figure to the left is a MakaiPlan screenshot with DTM module. A large raw data file has been subdivided into smaller sections using the DTM Manager. The individual sections were then gridded and shaded relief maps were generated from the gridded data. The red square represents a user-defined section of the bathymetry data that can be manipulated independently from other bathymetry sections.